And it ain't exactly cheap for the Lincoln Navigator either. Not all cars, trucks and SUVs have been converted from left- to right-hand drive by the automakers themselves. 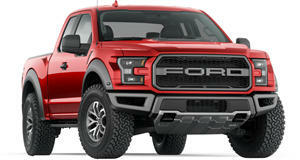 Even though Ford offers its Mustang with the steering wheel on the wrong side to UK buyers, the F-150 Raptor is left-hand-drive only, at least from the factory. Enter Clive Sutton, a UK luxury car dealer and right-hand-drive conversion specialist. They’ll gladly sell anxious UK buyers a brand-new Ford F-150 Raptor with the steering wheel located on the appropriate side for the local roads, but it won’t be cheap. A converted right-hand drive Raptor costs 89,000 GBP VAT for business buyers, 106,800 GBP including VAT for private buyers, and 38,400 with VAT for commissioning a conversion of an existing Raptor. Private buyers in the US are requested by Ford to pay a minimum of just over $50,000, just to compare. To its credit, the Clive Sutton team spent six months developing a right-hand drive conversion, and the reprogrammed Sync 3 infotainment system can now pick up full European navigation and frequencies. Along with the Raptor, Clive Sutton is also the first to import the new 2018 Lincoln Navigator, although a conversion option won’t be available until later this year. One Navigator has already arrived and lists for 114,950 GBP. If you recall, and will be importing from Austria, where both are built, the F-150 Super Snake “street truck” and Shelby F-150 off-road truck. . Is a conversion worth the cost, even though it’s perfectly legal to drive a left-hand drive vehicle in the UK? Look, if you’ve got the money, then why the hell not?